In 2016, water surpassed landscaping to become the single largest association expense. In round numbers, our water expense in 2014 and 2015 was $92,000. In 2016 it was $128,000. Since joining the board in February 2016, water usage is something that I have been tracking closely so I wanted to give an update on what's been happening, where we've come from, a project that we've been working on and where we're headed. Beginning in 2014 and continuing through 2015, the association worked with its landscaping and irrigation contractors to convert select areas of the property to xeriscaping and drip irrigation systems. While this effort did result in some savings reflected in 2015 usage vs the prior year, the overall cost of water to the association did not materially change (Fig. 1). This is largely due to the fact that as the population of Austin has become more water-wise and done a better job of conserving, the City of Austin water utility adjusts rates to offset the decline in revenue due to decreased water consumption. These adjustments are reflected Fig. 2 where you can see that the monthly fixed cost (the blue line) trends upwards while the variable cost (the green line) moves around depending on time of year. In March of 2016, we started working with our irrigation contractor on a pilot program testing a new type of commercial irrigation controller technology. These so-called "smart controllers" are essentially an Internet connected weather station that monitors temperature, humidity and rainfall, combines that with the vegetation and soil type to be watered and then adjusts its running time accordingly. The neighborhood common areas have 9 distinct water meters and, due to the size of our property, there may be up to three irrigation controllers on each meter. For this pilot, we selected the meter with the highest usage during the previous two years and converted the 3 existing controllers on it to the new smart-controllers and then began the process of monitoring our usage. Unfortunately, right as we started the pilot, we had an ongoing series of major line disruptions through much of the summer and fall that are making it difficult to determine the overall effectiveness of these controllers. 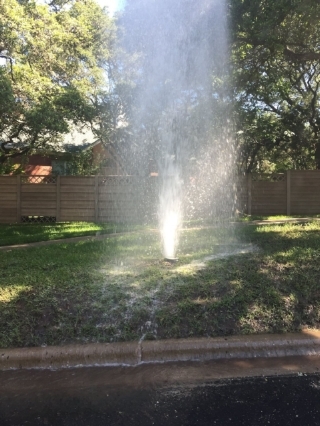 If you see something like this, we ask that you immediately contact our property manager using one of the methods here so that we can get the irrigation company out to address the issue. We also have the manager@canyoncreek.net and board@canyoncreek.net e-mail addresses that are continuously monitored. Nextdoor or other social media outlets are not the appropriate venue for notifications of this type because there is no guarantee they will be seen in a timely fashion by anyone capable of responding. The number and severity of the line breakages and resulting water usage coupled with the ongoing rate hikes are the primary causes of the significant increase in water costs this year. Our expectation is that our usage will return to more normal levels with the completion of the AT&T work as well as the repairs that were made to aging lines and valves. Nevertheless, there is evidence that the smart-controllers are having an effect - even with some of the leaks impacting the pilot project, water usage on that meter was down 12% from the previous year which resulted in a 14% cost reduction. Without the line breakages, the realized savings could have been much higher so these results are encouraging. I'm continuing to monitor the water usage and we have a small budget allocation for 2017 to expand the pilot to additional meters if the data continues to look promising. Unfortunately, we also still expect ongoing increases in water rates from the city so the long term outlook continues to favor increasing water costs. If we are to further reduce our water expenditures (or indeed, just to hold them constant) we may need to consider more drastic options such as major xeriscaping projects in the medians or even large scale sod removal and alternate landscaping in some areas.